Lindy's Rigger saves you time and eliminates frustrating snarls. This convenient anti-tangle storage system is great for snells of any length. Simply wind and unwind snells and leaders. 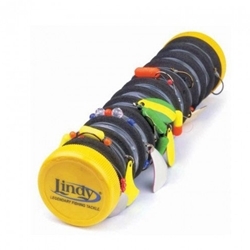 Lindy's Rigger features 12 divisions with unique keeper slits that reliably holds snells in place with its high-density foam. These organizers take up little space and they float too!